Today, we make electric fuel. The best part is that the only exhaust is pure water! At the head of each screw, wrap a bit of stripped wire to make an electrical contact. You can solder these connections if you plan on long-term experiments, but wrapping is just fine for now. 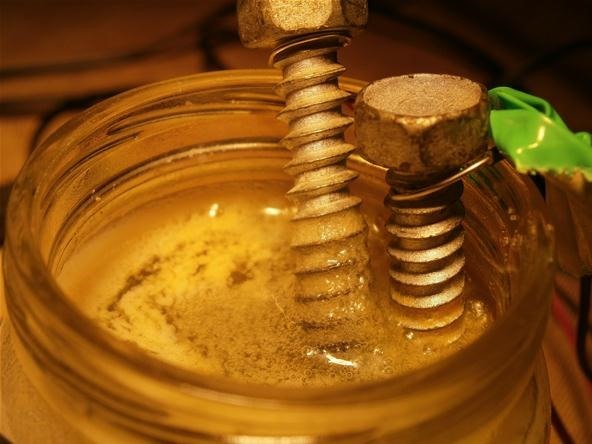 Place your screws in the jar of salt water so that the wires are not submerged. To get the hydrogen fuel cell going, take the ends of the screw wires and connect them to the leads on a 9 volt battery. You can use any DC power source, but 9 volts is a common source. You will begin to see and hear bubbles forming on the screws and rising up to the surface of the water. One screw is collecting hydrogen while the other collects oxygen. 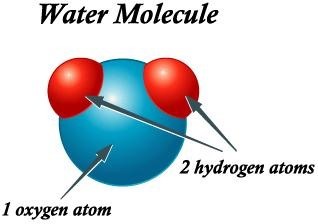 Because there is twice as much hydrogen as oxygen in a water molecule, the hydrogen collecting electrode will produce much more gas. Here is where we turn the tables. While most of the gasses bubble up, some are trapped in the ridges of the screws. These trapped gasses can be recombined into water. While recombining, this process will generate electricity! Remove the power supply and place the multimeter probes on the screws. You should see a small amount of voltage register. As the gas is used up, the voltage coming from the jar will decrease. What modifications can you make to this design to crank up the usable volts? Share your insights on the forum or in the comments below. Be sure to post up pictures and videos onto the corkboard if you try this experiment yourself! If you are stuck somewhere or just have a question, ask in the comments or message me directly. Is the salt water just water with salt from the kitchen or is it like in the sea? Just regular old table salt. Why salt water? would distilled car batt water work? I believe you can also use baking powder to do the same which is to increase the conductive properties of the water. Baking powder also gets better results. Test it with your voltage meter to see. Distilled water has very poor conduction. The reason distilled is used in the batteries is simply to introduce as few impurities as possible. this project works best with platinum wire. Using a metal fine mesh screen trapped inside some sort of close contact container (about .005-.01 inch of space between the non-conductive container and the screen...like a sandwich) that is openable enough for water to satuate the screen in the sodium-water solution. Each molacule that gets seperated inside the screen will be trapped in the enclosure. When you apply the initial charge to electolize it, the hydrogen is the most important part of it. So honestly you can lose the oxegen that is left over. The charged sandwich is like a battery now. It is just a scaled up version of a hydrogen fule cell that is in hybrid cars. But yours in layers can power your RC car for several minuts if you have enough layers and the water is clean enough. wonderhowto.com is a wonderfull web sight/page and best school with full of best teachers. thanks all members specialy contributers.i am new comer;just few hours ago,and i like it all. So glad to hear it cocody! We love interacting with our members so please feel free to post on the corkboard and forum! Thanks for insight in the forum. This hydrogen fuel cell should surely revolutionize the world of energy. I cannot think of trapping this hydrogen and using it to produce electricity. Please keep posting and I will keep reading. A stage may come when I will also be able to contribute something for this world. I tried it, it produced gas but after a minute, a green thing appeared on the surface of the brine. We're you using copper? If so it was likely oxidized copper. In brine and with all of that loose oxygen with a current running through it the copper should oxidize very rapidly. I'd like to point out that electrolysis of salt water produces chlorine gas! Not hydrogen and oxygen. Chlorine gas is incredibly toxic and can result in permanent respiratory damage, blindness, and death. is it possible to use a pencil since a pencil graphite can act as a catalyst?